Following their sold-out talk at Vivid Ideas, Rebel 8 co-founders Joshy D and Mike Giant are coming to the Front Bar for a spontaneous Front Bar takeover! There’ll be a meet & greet, exclusive merch, DJs, artwork and plenty more. 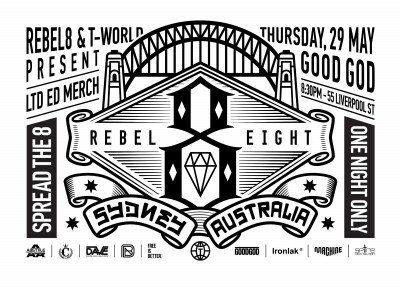 Kicking off 8:30 and goin’ til late, don’t miss this chance to meet the brains behind the legendary REBEL8 label.